Are you done with your christmas shopping already? If not, then get your shopping carts ready for an early holiday outfit shopping or gift buying for your kids! 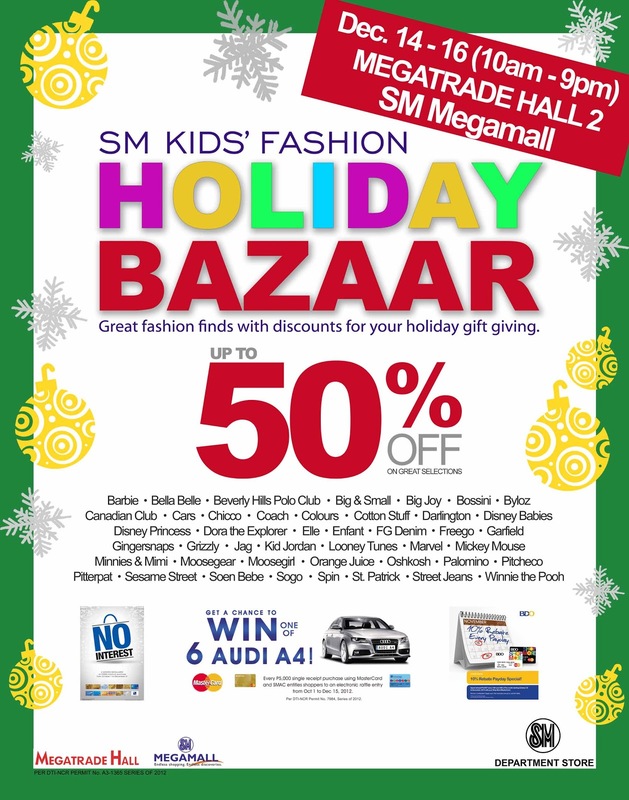 Catch the 2nd leg of SM Kid’s Holiday Bazaar for everyone on December 14 to 16 at Megatrade Hall 2, 5th level, Mega B, SM Megamall. A jaw-dropping 50% off on selected items on your favorite brands - Barbie, Bella Belle, Beverly Hills Polo Club, Moose Gear, Elle and Gingersnaps are in store for your kids. Plus get a free limited edition tote bag for every Php. 5,000.00 worth of shopping during the event! So don’t forget to mark the dates on your calendar and spend your early Christmas shopping with us! All major credit cards are accepted, you may also avail 6 months installment at 0% on Php. 5,000.00 minimum purchase! Admission is Free! Last day is today so don't forget to drop by! Happy Shopping!